The first two of the sayings above were collected by Miriam Schüttler and others are taken from Athenaze (see below). If anyone would like to offer additions they can send email them to me here. For classical Greek Mastronarde's Ancient Greek Tutorials covers alphabet and pronunciation (with sound files added but these were not working when accessed in February 2019), accentuation and the main grammatical paradigms, including both tables and drills. on the same topic. There are also details of their own on-line course, which uses Athenaze (see below) as textbook. There are links to many other resources on the Greek Language and Linguistics site and, for those who read German, Gerhard Salomon's 1933 course has been made available on-line by E. Gottwein. This course is rather old-fashioned in approach but well set out and with a large number of sentences and passages presented both in Greek and in German translation. Also available in German is guidance on writing Greek letters in electronic formats on Thomas Ihnken's site.. Most of the standard ancient texts are available both on the Perseus site and in the Bibliotheca Augustana, which, whilst not providing the hyper-linked help offered on Perseus, has a much more attractive typeface. Compared with Latin, there is relatively little contemporary writing in classical Greek but Acropolis World News, run by Catalan scholar Juan Coderch from St. Andrew's University in Scotland, provides news bulletins in the language on similar lines to Finnish Radio's Nuntii Latini, though without any recordings. His site also has a short list of suggested translations for modern concepts, whilst Woodhouse's English-Classical Greek dictionary (restricted to words and phrases attested in ancient authors) is also available on-line. ​A good overview of ancient Greek culture and its relationship to the modern world is provided by Cambridge professor Paul Cartledge in a November 2010 article in the Guardian newspaper. Ah, Guten Tag! Guten Morgen, Karl! Guten Morgen, Gustav! (Erwiderung). Seien Sie mir schön willkommen! Ah! freue mich außerordentlich! Freue mich außerordentlich, Herr Müller! Well, Hello there! Good morning, Charles! Good morning, Gustav! I’m delighted to see you! Well, I welcome you heartily! I welcome you warmly, Mr. Miller! ​Another aid to conversation, published in 1871 and written by a Scottish university professor, John Blackie, can be read on the Archive.org site and also downloaded in various formats (the pdf version is provided by Google books and not available to users in Hong Kong). Although modern Greek is much closer to the ancient language than modern English is to Old English, there have been major shifts in pronunciation. In Greece itself, it is customary to read the ancient texts with modern pronunciation whilst elswhere students are taught to make the sounds of the ancient language as scholars have been able to reconstruct them. The evidence for the older system includes the use in a fifth century B.C. drama of the onomatopoeic phrase βη βη for the sound made by a sheep. This would be read as `vī vī' on the modern Greek system, but as the much more plausible `bē bē' on the reconstructed one. Other evidence is presented in detail in Sydney Allen's Vox Graeca and the timing of subsequent changes discussed in David Horrocks' Greek: a History of the Language and its Speakers. The speech of writers of the New Testament (1st/2nd. cent. A.D.) probably already incorporated some of the featurs of modern Greek (e.g. the fricative proununciation of β, θ, χ and φ ) but by no means all. Ancient Greek had a pitch accent whose exact nature is still disputed by scholars but which by the early centuries A.D. had turned into the stress accent which modern Greek retains on the same syllables. Luke Ranieri makes an interesting attempt to recreate the original pitch system in his Athenaze recording (the second YouTube video embedded below). Sean Gabbs of Guildhall University provides a useful survey of the different ways in which the accentuation markings introduced in the Hellenistic period and still retained in modern printed texts are pronounced - or not pronounced - by classicists today (see download at the bottom of the page). Students in Holland, the UK and Commonwealth countries, if given any guidance on the topic, have traditionally been told to stress Greek words as if they were Latin ones (!) whilst in the USA and many other countries the stress is put on syllables bearing an acute or circumflex accent. For a robust defence of the latter method, which is both more authentic and facilitates the leaning of modern Greek also, see Vox Graeca. The best known beginners' course in the UK was formerly Athenaze, featuring the story of an Attic farmer and his family in the 5th century A. D. and with the emphasis on reading rather than rapid presentation of grammar. The latter is nevertheless treated thoroughly and, in contrast to many other courses, the learner is expected to master from the start the system of accents developed in the Hellenistic period and still normally used in modern editions of the ancient Greek texts. The Teacher's Handbook for Book I and for Book II can be read on-line or downloaded to your computer. `Ariadne: resources for Athenaze', a collection of pages on the Cornell College site, includes background information and suggestions for activities, including scripts for oral practice, as well as recordings of the vocabulary - up to chapter 12 in June 2011. 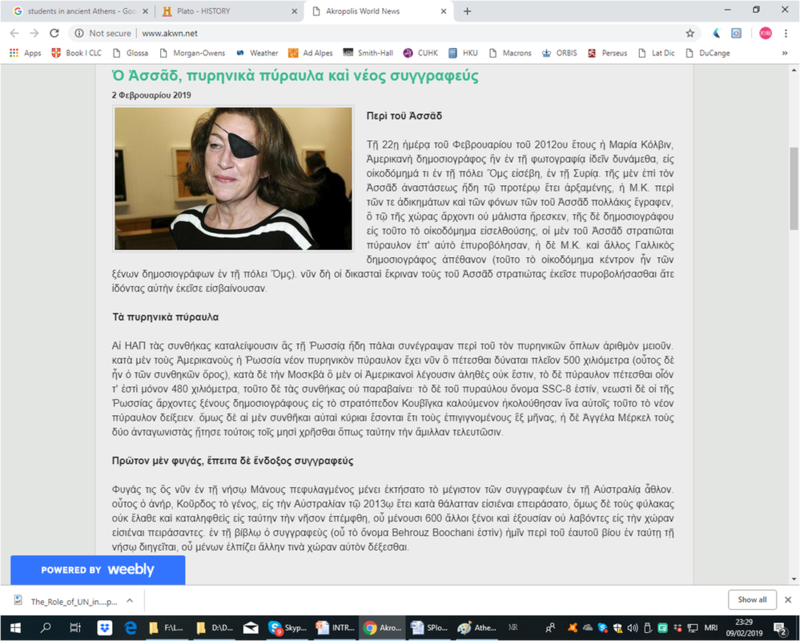 To read the Greek on this site is is necessary to install the SPIonic font, which can be downloaded from ​here The font site also provides a keyboard map for anyone wishing to type as well as read Greek. The reading passages in Athenaze can be sampled from the Italian edition on the Viarium Novum site. The Italian version ha been modified to make the presentation more similar to that in Orberg's direct method Lingua Latina per se Illustrata, with key vocabulary and phrseas often explained by pictures and diagrams in the margins. There is also some additional reading materials This edition, however, does however use Italian for grammatical explanations and translation exercises. The passages in chapters one and two have been recorded and uploaded to YouTube by American polymath Luke Ranieri (`ScorpioMartianus') who attempts to recreate the original pitch accent of ancient Greek (see also below). Perhaps unortunately, Athenaze has now (2019) been supplanted as the most commonly used textbook in Britain by John Taylor's Greek to GCSE , which is specifically geared to the OCR Classical Greek GCSE curriculum introduced in 2016 and focussed on direct learning of the grammar and vocabulary required for the exam rather than on extensive reading. Although students are told in the middle of the book that they can chose whether to stress Greek words according to the printed accents or to the Latinate system traditional in the UK, the accents themselves are not shown from the start. An answer key is available on-line after registration on the publisher(Bloomsbury)'s website. Flashcards for the vocabulary in each chapterare being linked to the Flashcards page on my site. Another course book well established in the UK but also available on the American Amazon site is the Joint Association of Classical Teachers' Reading Greek, which is intended for learners in the upper forms of schools or in universities as well as for independent adult learners. The student has to use both the Text and Vocabulary and the Grammar and Exercises volumes and, if working alone, will also require the Independent Study Guide. Ancient Greek Alive starts with lessons introducing both the Greek alphabet and simple dialogues, with the teacher, for example, getting students to ask each other's names in Greek. Subsequent lessons use reading passages drawn from folk tales around the world, as well as covering the basic grammar and emphasising vocabulary review. An extensive preview is available on Amazon and a comprehensive account in the Bryn Mawr Classical Review. There is no introductory course written totally in ancient Greek but the Italian edition of Athenaze has been adapted by Luigi Miraglia to make it more similar to Oerberg's direct method Latin course and a preview is available on the Vivarium Novum website (click on `Sfoglia'), from where the book can also be ordered. W.H.D. Rouse wrote a beginners' reader, A Greek Boy at Home, which can be freely downloaded from the Internet (see sample pages below) and is narrated in the person of a a Greek boy, Thrasymachus, living on a farm with his parents. brother, sister and nurse. The book, published in 1909, includes dialogues easily adaptable as comprehension exercises and intended to promote active use of the language by both teacher and students. The reader was meant to be used together with the author's First Greek Course (also downloadable as a pdf but with the text on its side and so only easily readable if printed out). The vocabulary for the reader is given in a second volume which can also be downloaded. 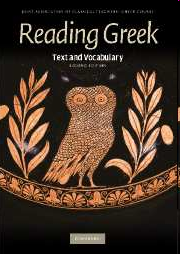 Anne Mahoney has recently (February 2011) brought out a substantially revised edition of First Greek Course adapted for college courses (extracts viewable on the Focus site), and also a slightly modified version of the reader, with both passages and vocabulary in a single volume - Rouse's Greek Boy (2010) . There is an online review of the re-issued reader in the Bryn Mawr Classical Review. Anne Mahoney has also brought out a revised edition of Francis Morice's Stories in Attic Greek, which was originally published in 1879 and intended to serve as a transitional reader for intermediate students who had already covered basic grammar but might still find unadapted Greek authors difficult. The stories themselves are, however, often based on ancient materials. Kendrick's 1851 textbook, Greek Ollendorff, which includes some conversational material with a systematic presentation of grammar, in a somewhat similar fashion to Adler's Practical Grammar of the Latin Language, can be read on-line or down-loaded in various formats from archiv.com Evan Millner is currently recording and uploading the exercises and vocabulary t0 his Ancient Greek podcast site. Kendrick's text can also be ordered as a facsimile reprint from Amazon. Schroder and Horrigan's A Reading Course in Homeric Greek, Book 1 of which a 3rd edition, revised by Leslie Collins Edwards, was issued in 2004, introduces the student to Greek as used by its best-known poet, who probably wrote in the 8th century B.C., employing rather simpler syntax than the classical language of the 5th and 4th centuries on which most introductory courses are based. The student is reading short extracts of genuine Homer from lesson 11 onwards and the book concludes with the stories of the Lotus Eaters and the Cyclops from Book 9 of the Odyssey. A pdf including the introduction and some sample pages is down-loadable from the Focus Publishing site but a rather more pages of the actual text are available in the preview on Amazon. There is a largely favourable evaluation in the Bryn Mawr Classical Review. Edward's 2005 edition of Book 2 is considerably shorter than Schroder and Horrigan's original, providing the complete texts of Books 6 and 12 of the Odyssey with commentary, vocabulary and further information on grammar but no extracts from the Iliad (despite what is stated on the Amazon page)! There is finally a shorter volume, Transition to Attic Greek to aid those who have completed the Homeric course and wish to move on to read texts by later authors. Those wishing to focus on Homer should certainly listen also to the first 27 lines of the Odyssey recited in reconstructed ancient pronunciation by a native speaker of Greek in the video embodies above. Cynthia Sheldermine's Introduction to Greek, based on Wilding's Greek for Beginners, uses adaptated texts from Herodotus, the 5th century historian (see sample below), as well as from Xenophon, Thucydides and Plato. There is an evaluation in the Bryn Mawr Classical Review. The approach is traditional, with presentation of grammar followed by practice sentences for translation into as well as from Greek, a reading passage and a vocabulary list for memorisation. The same publisher has also brought out Anne Groton's From Alpha to Omega: a Beginning Course in Classical Greek. Another series of texts with similar extensive support for the learner is being produced by Evan Hayes and Stephen Nimis of the University of Miami. The first volume is Lucian's Ἀληθῆ Διηγήματα (`A True Story'), written in the 2nd. century A.D. and telling the story of a ship swept up to the moon is the first in a series of editions of Greek and Latin texts planned by Evan Hayes and Stephen Nimis. A preview of the book is available on Amazon and sample pages can also be downloaded as a 24-page pdf file. The books are very reasonably priced as they are being self-published on a `print-on-demand' basis. Stephen Nimis is currently (April 2011)asking for suggestions on which Greek and Latin texts to work on next and can be contacted via his home page . We do not know for certain what ancient Greek music sounded like but an interesting attempt at reconstruction is available on the CD `Musique de la Grèce antique' by Atrium Musicae de Madrid. This recording is currently (February 2013) also available on YouTube, which also has a number of other versions of what is claimed to be ancient Greek music, including in particular performances of the `Song of Seikilos', believed to have been composed somewhere between 200 B.C and 200 A.D. and an album lasting almost an hour posted by `ThoughtTraveller'. Michael Levy provides what he describes as a combination of ancient Freek elements with his own ideas in his Ancient Greek Music - the Lyre of Classical Antiquity. ​Martin West, the most distinguished British classical scholar of his generation, wrote a comprehensive survey, Ancient Greek Music, intended to be accessible to to those without musical training, and also co-edited a collection of all extant fragments, Documents of Ancient Greek Music . Stefan Hagel, author of the most recent comprehensive study of the topic (Ancient Greek Music. A New Technical History, Cambridge 2009) has electronic renditions of the main surviving melodies on his Ancient Greek Music site. An episode in RTHK Radio 4's `Early Music' series features recordings from the Atrium Musicae CD and elsewhere - make sure you are downloading the 3 July 2011 episode, which appears from the site description to be part of the `Oratorio' series but is not! As well as being used in the chorus sections of Greek plays, music may also often have accompanied the recitation of other poetry. Φαίνεταί μοι κῆνος ἴσος θέοισιν (`He seems to me the equal of the gods'), the most famous of the lyric poems by Sappho of Lesbos, who was writing around the beginning of the 6th century B.C., has been set to modern music and can be heard on YouTube with the original text with English and German translations shown on the video The singer in this performance adds the words alla pan tolmaton (``everything must be taken') at the end of the song . Sappho describes her intense feelings as she watches a girl with whom she is herself in love talking with a boyfriend. καὶ γελαίσ‹ας› ἰμέροεν, τό μ᾽ ἦ μάν καρδίαν ἐν στήθεσιν ἐπτόαισεν. heart in my breast has set pounding. A very different, more modern musical interpretation of this poem has been recorded by the group Trinovox. A short appeal for inspiration to Calliope, muse of epic poetry, and to Apollo, son of Latona, by Mesomedes of Crete, a freedman of the emperor Hadrian (reigned 117-138 A.D.), sung here by Daphne Panourgia with orchestration by Petros Tabouris. The lyrics are given below in the original Ionic Greek with translations into Standard Modern Greek and English as uploaded by `Lynkeas' with the YouTube video in January 2009.
να δονήσει τις φρένες μου! ​τέκνο της Λητούς, Δήλιε, Παιάν, ευμενείς, παρασταθήτε μου! help me start my song. offer your help, favorable to me! Another interpretation of the hymn, in more modern musical style, is provided by Thanapis Kleopas. `Agni Parthene' is a hymn to the Virgin Mary written around the beginning of the 20th century by the Greek Orthodox bishop St. Nektarios of Aegina. though the transcription given here represents the Byzantine pronunciation, word forms are almost all identical to those used in classical Greek and the phrasing echoes a long tradition of chant going back to the cult of the Mother Goddess of the Mediterranean region. Note that the couplets below were written as single lines in the source from which the text is taken (Wikipedia) as were the second and third lines of the quadrains; the alteration was purely to facilitate displaying the text, transcription and translation in parallel columns. The translation has been modified to make it more literal. The hymn can be heard with accompanying slides on YouTube and the video is also embodied below. For more information on pre-classical Greek religion see volume 22 of Aegaeum, downloadable as a series of PDF files. There are a number of other performances available on Youtube including one by the monks of Simonopetra Monastery. Ancient Greek had a pitch accent whose exact nature is still disputed by scholars but which by the early centuries A.D. had turned into the stress accent which modern Greek retains. Luke Ranieri makes an interesting attempt to recreate the original p[itch system in the YouTube video embedded above. Sean Gabbs of Guildhall University provides a useful survey of the different ways in which the accentuation markings introduced in the Hellenistic period and still retained in modern printed texts are pronounced - or not pronounced - by classicists today. Students in Holland, the UK and Commonwealth countries, if given any guidance on the topic, have traditionally been told to stress Greek words as if they were Latin ones (!) whilst in the USA and many other countries the stress is put on syllables bearing an acute or circumflex accent. For a robust defence of the latter method, see Sydeny Allen's Vox Graeca.